A five-time Jeopardy! 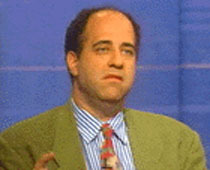 champion, Podhoretz wrote a television column for the Washington Times newspaper. According to a friend, "There's no Seinfeld or Mary Tyler Moore reference he wouldn't get." Known around the office as insufferable, Podhoretz was introduced to visitors as "John P. Normanson." Former speechwriter for Ronald Reagan and George H.W. Bush, he later served as special assistant to Drug Czar William Bennett. Podhoretz found his wife Ayala through an internet dating service.